ChrisWeigant.com » Friday Talking Points  -- Frankenstorm! Hank For Senate! Friday Talking Points  -- Frankenstorm! Hank For Senate! No matter what your political affiliations, I think we can all agree we're getting a little burnt out on Election 2012. "When will it end?" we wonder -- and we don't even live in a state currently under siege in the continuing television ad war. We can only imagine what Ohioans, Floridians, and Virginians must be experiencing right now. Maybe it's just me, but it seems we've entered a lull in the election. Maybe it's just my own exhaustion with our quadrennial political circus, but it seems things have settled in for the bitter end of the campaign. Mitt Romney and Barack Obama have made their points, and are out there fighting for every last undecided voter (in certain states). The only unknown in the political world is going to become an obsession among the chattering classes precisely one week from today, as the last monthly unemployment rate figure is released, mere days before the election. In the meantime, Hallowe'en will take place. So we're going to take a break from the presidential election this week, and instead make what is (to the best of our memory) our very first official endorsement of any candidate for political office. But we'll get to Hank in a moment. Because it is Hallowe'en week (we suppose), the story broke today that none other than the venerable Meat Loaf had announced his support for Mitt Romney. Also, a late-season hurricane is threatening the East Coast, and we're pleased to see the mass media has come up with a seasonally-appropriate cutesy-pie name. All large weather events now get their own moniker, logo, and (we assume) theme music, because there are whole graphics departments sitting around in national television network headquarters with very little else to do right now (or something). This is even more ridiculous when you consider that hurricanes actually already have their own name and everything. But I guess "Sandy" just doesn't strike the proper amount of fear in the public's heart. That's understandable, since every "Sandy" I've ever known has been pleasant, friendly, and great to be around in general. Since "Everyone flee! Sandy approaches!" wasn't going to work, the creative departments went back to the drawing board. What is notable is that they have foregone their "go-to" labels of the past few years. That's right: Sandy will not be described as either "something-geddon" or the "something-pocalypse." We heartily approve of this, because as we've written before, both were rather trite and annoying. Instead, we're all cowering in fear of something much more Hallowe'en-ey: Frankenstorm. Now there's a scary title! Frankenstorm is definitely more along the lines of something the citizens would flee, in our humble opinion. President Barack Obama turned in his best debate performance yet at the beginning of this week, and impressively dominated Mitt Romney for an hour and a half. Which makes him a shoo-in, for the second week running, for Most Impressive Democrat Of The Week. We can only wonder where the race would be now if Obama had performed as well in his first debate as he did in his third. Of course, any sitting president always has an enormous edge over any challenger when debating foreign policy, because rather than trying to remember all the factoids crammed in during debate prep, presidents actually deal with this stuff on a daily basis. You can bet that Obama knows full well that Iran has access to water without having to rely on Syria, for instance. Barack Obama is a good "closer" in political terms. In 2008, there were many moments when Democrats got very anxious about Obama keeping out of the fray, but Obama closed the deal in the end, which was what mattered. Now that we come down to the final days of the campaign, Obama is in top form as a candidate. The race is neck and neck in quite a few battleground states, and Obama will need a final push to get across the finish line. While he's been setting a furious pace hopscotching between all these battleground states, the debates are seen by a lot more people than any one campaign rally. And Obama did himself a world of good this week in his final face-off with Mitt Romney. Which makes him the winner of our Most Impressive Democrat Of The Week, as well. Nobody really disappointed us enough to qualify for the Most Disappointing Democrat Of The Week this week. If we've missed anyone, feel free as always to suggest a name in the comments. It is a little disappointing, as always, not to see Senator Al Franken jump on such easy comedic opportunities as the upcoming "Frankenstorm" (which, obviously, seems tailor-made for a Franken quip... after all, the man had a whole decade named after him...), but this doesn't rise to the level of the MDDOTW. Al Franken doesn't have to prove his comedy chops. We all know the man is hilarious, and could easily come up with some play on his name this week. But Franken is also a very serious senator, who cares about people. So, sadly for the rest of us, he won't risk making a joke about a storm that could prove to be deadly. Also, he is currently marking the tenth anniversary of Senator Paul Wellstone's untimely death, so it's probably not a very funny week for Al anyways. So while our own selfish outlook is that it'd be great to hear a zinger from Al on the upcoming "Frankenstorm," we also realize that it simply is not going to happen. Hank is running for the open Senate seat in Virginia. You may not have heard of his campaign, but that doesn't make it any less important. While we have, up until now, maintained our journalistic arms-length policy which dictates we neither link to any candidate's campaign website nor openly endorse candidates for any office, we feel that Hank's candidacy is such an important one that we are making our first official endorsement ever: Hank for Senate! Hank, as you may have noticed, is a cat. 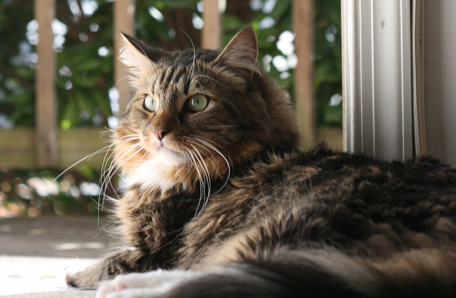 Or, perhaps, "feline American," we're not entirely sure. 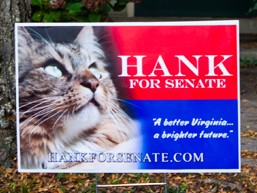 But just so nobody could say that we're just a sucker for a furry face, we decided to call up the "Hank For Senate" campaign and get the real story on Hank's ground-breaking candidacy. What follows, instead of our normal weekly talking points, is the interview we conducted with Matthew O'Leary, Hank's campaign manager. Hank was busy giving a speech, and was unavailable to be interviewed himself, but Matthew kindly filled us in on the state of Hank's campaign. While we do not reside in the Commonwealth of Virginia, after our interview we decided to throw what support we could behind Hank, for reasons that will become obvious. We heartily encourage everyone to visit the Hank For Senate web page, and offer your own support as well, whether you live in Virginia or not. Buy a T shirt and show your support for Hank! Do it today! What is Hank's political party? Hank is running as an Independent. What campaign slogan is Hank running on? A better Virginia, a brighter future. Is Hank on the Virginia ballot as a Senate candidate? Or is Hank running as a write-in candidate? We tried to get him on the ballot, but we didn't get the required 10,000 signatures. We turned in the signatures we had to the Virginia state board of elections, but they told us non-humans were not allowed on the ballot. We looked, and there's nothing in the Virginia state constitution which says this, but that's what they claimed. So Hank is waging a write-in campaign in November. What does Hank think of his chances as a write-in? Hank would like to remind voters that more than one senator have been elected through a write-in campaign. Strom Thurmond actually won as a write-in candidate, and there was recently a senator elected from Alaska through a write-in campaign. What are Hank's goals in this election? Hank's biggest concern is for animal rescue charities throughout Virginia. Hank has raised over $15,000 -- all of which is donated to animal rescue charities. We sent our Animal Rescue Pledge to the campaigns of both Tim Kaine and George Allen, in an effort to get every candidate in the race to match the money we are donating, dollar-for-dollar. Although we've repeatedly called both campaigns, we still haven't gotten an answer from either. So they're giving you the run-around? Well, neither one of them has actually said "no" yet. Hank originally was hoping to have them donate all their campaign contributions to charity, as he is; but we remain hopeful that we can convince both campaigns to at least match our $15,000 donation to animal rescue charities -- we think that's the least they could do. We're still calling them and bugging them for an answer. Can you comment on the rumors that Hank was involved in a scandal at a well-known Washington hotel? That image was Photoshopped! We have issued a full and complete denial that Hank has any connection whatsoever to the Mayflower Hotel. He's never even been there. Hank was shocked when he heard of this mudslinging attempt, and this ovbiously-faked photo. Has Hank made any campaign promises? He was quoted early on in the campaign promising "milk in every bowl." Will you be doing any last-minute campaigning? Before the election, we do have a number of people going door-to-door, canvassing for Hank and asking for donations, because Hank really would like to see as much money as possible go to worthy Virginia animal charities. wait, you said senate. darn! The campaign website is very impressive, I have to admit. I'll get to the FTP later today, but I wanted to ask a simple question..
With all the really BIG problems we have, terrorism, economy, etc etc, why has Team Obama expended so much money and energy talking about Big Bird, Binders and Bayonets?? The debates were about serious issues and problems facing this country, but Team Obama took the most useless and obscure reference from each of the debates and made it their campaign theme.. When is Obama going to get serious??? Went from a 300sq ft shop to a 1000sq ft shop... WOOT!!!! congrats on the new space! Thanx... It was sorely needed..
Congrats on the new store space! Again, you are confusing 'guy on the street/internet' with 'Team Obama'. Big Bird was the only actual Team Obama advert from those you listed. Congrats, Michale! That's great news! I'm sending good vibes your way — and prayers! You know us relgious types. Has Hank attained the age of 35 years, or is he claiming to be exempt from that requirement on grounds of not being a person? hank is certainly over 35 in cat years. the constitution doesn't say the age has to be in human years, does it? What is the ratio for cat years?? Dog years is 1:7, right?? First, the Constitution only says 30 years. Hank's running for Senate, not President (although, in a few years?...). Second, I think 1:5 years is the right ratio. 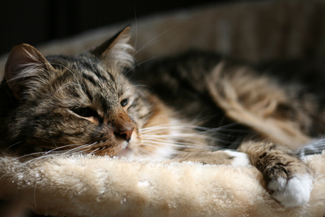 Some cats live to 20. So Hank's only got to be 6 human years old. Mea culpa. Of course I know it's 30 for Senate. I just had a brain fart. This World Series was ALL San Francisco Giants!!! I actually took a nap half-way through the game and just woke up now. Aside from the Panda-monium of Game One, this series ranks, for me at least, as one of the most lopsided and uninspiring series of all time. Not to take anything away from the Giants, though - they did good! Wow ... Giants sweep! Now there's a bet I wish I'd of had in Vegas. Who would a thunk? And yeah, the news from Ohio is that we just want our TVs back. So, anyone wanna organize an Election Night Blog Party??? Sorry Michale I won't be around :0! Michale, ole pal of mine ... you don't really think that Romney is going to win this thing, do you? I think Vice President Biden, as President of the Senate, should invite Hank to the chamber in the New Year and give him the grande tour. Well, of course Harry will show Hank around the Senate chamber, because Hank's going to win! Woo hoo! That "get that camera out of my face" photo still cracks me up. 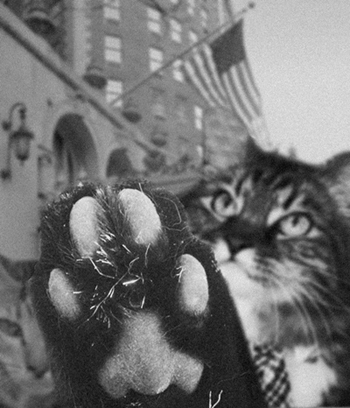 I love the paw in the lens, and I love the very subtle (assumably female) cat in the corner, as well. Really well-done spoof! No, no, no ... THAT was funny! No need to apologize for that little gem. I would just add that this edition of FTP is one of the very best, in many more ways than one! OK, guess we have to go with F.T.P.